ourselves reluctantly out of bed to meet up with Bryan Carrington, Tyler McPherson, Jesse, and our new friends Ben and Tiah Sigler. We met at Tyler’s house then headed out to Ben’s to pick up gear and head to the river about 2.5 hours away. We put in at a site called Boulder Flats and ran the river to our take out at Gravel Bin. It was the first time Emily had been introduced to Bryan’s amazing van. Although I don’t have a photo of his van to put it in perspective it looks as if it could eat the A-Team van for breakfast. We watched some stand up comedy video on his DVD player on the ride down. river with a rope swing but none of us swung into the cold river. The scenery around us on the Umpqua was amazing all day long. The river was pretty low and we found ourselves sometimes stuck on the rocks but Ben got us unstuck. Ben even showed us the tip of a tree that he had broken off with his face years ago when the water was higher! crazy (when I say crazy I mean scary as hell) ride back with Bryan in his Van to Corvallis after we took out. He has doulie tires and said, “don’t worry guys, the tires aren’t even screaming yet” as we barrelled down the twisty road at what seemed like, and probably was, 80mph! We stopped for dinner at a McMenemins where we all got a bunch of appetizers and burgers. 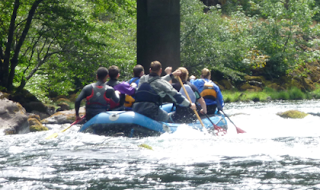 They all invited Emily and I on their annual Wild & Scenic Rogue River trip at the end of October which we definitely excepted because I had been wanting to do it for a long time. We got home late at night with Emily passed out for most of the ride home as usual. Getting up tomorrow for Three Fingered Jack would be tough!